Cinderblocks 3: The Partnership with Patients Continues is an art and medical conference that will be held in Grantsville, MD at Penn Alps Resturant and Little Crossings by The Cornucopia Café May 19-21, 2016. I founded this event with the help of several other epatients and I am happy to see it enter its third year. I am known in healthcare circles as the artist that founded the international patient right’s movement called The Walking Gallery. 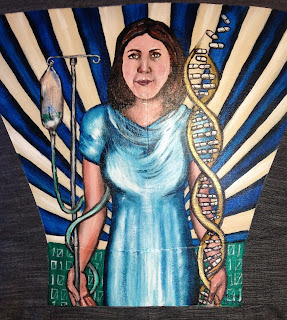 I and 43 other artists paint patients stories on the backs of jackets that people wear to medical conferences. I see Cinderblocks 3 a continuation of the message of The Walking Gallery and as venue that prizes the patient and provider in equal measure. We will use our days at this conference to focus on improving health care everywhere. Presenters during the regular conference sessions include Dave deBronkart, an internationally renowned patient rights advocate and cancer survivor and Mary Camp, a patient experience strategist at Memotext, presenting on the user experience in healthcare and Ontario's Colin Hung co-founder of Healthcare leader chat will present also. Local speakers include Garrett Regional Medical Center, President and CEO, Mark Boucot as well as Garrett County Commissioner Paul Edwards. I will post a full conference agenda soon. Conference tickets are available online at https://www.eventbrite.com/e/cinderblocks3-the-partnership-with-patients-continues-tickets-19821171658 for any individual wanting to attend the event. There are a variety of ticket levels for all who want to take part. The conference sessions will run from 8:00 am to 3:00pm each day. On Thursday, May 19th at 6:00pm a dedication will be held for Salt and Pepper Studios: the new home for the Walking Gallery. Conference attendees are invited to come to 189 Main Street in Grantsville and see the art center that I am creating. Refreshments will be provided and the dedication is free and open to the public. On Friday, May 20th the conference will host a free concert at Little Crossings field behind the Cassleman Bridge. The Walking Gallery will gather at 6:00 at the Casselman Bridge. Several local acts will perform starting at 6:30 pm. At 8:00 pm country and western singer, Wade Hayes will perform both old and new songs and he will explain his cancer journey. The final performer will be fire dancer and physical therapy student Aaron Smith. Saturday, May 21st, is the last day of Cinderblocks3 and on this day the content will be live-streamed to Switzerland. There will also be artists displaying their work at an Art in the Park event at Casselman Bridge State Park. We highly encourage attendees to walk through the park and see all the art on display. Little Crossings will also host juried artists and local food venders for an Artisan and Epicurean Faire. Shuttle service will be available from town to the Penn Alps Campus Friday night and Saturday during the day. In the spring of 2009, I was helping students at four different schools in Washington, DC complete class projects for their respective school auctions. One of the most popular class creations was a Warhol inspired painting. For this project I would copy pictures of the children onto rice paper using a Xerox copier. They would then paint self-portraits using bright and whimsical colors. I could not print the photos with an ink jet printer because the colors would run. I could not print the photos with a laser printer, as the laser image would not take paint. I would copy face after face and dry toner was my friend. In the spring of 2009, husband Fred was hospitalized with stage four cancer. I still had to finish the class creations while I cared for a very sick husband. The night I finished the last Warhol project, I cried and cried above so many copied faces. I had been researching my husband’s condition; I knew there was a great chance he would die soon. Late into the night I worked on that project, my tears mixed with the gel medium as I adhered each little face. The colors did not run, as my mind raced and dry toner was my friend. A few weeks ago Jim Mignano reached out to me, he works with Xerox Healthcare. He was very impressed with The Walking Gallery and my focus on the patient perspective in healthcare. 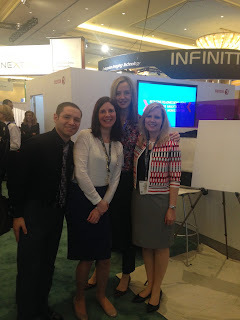 He asked if I would be willing to come to Las Vegas for HIMSS 2016 and be their guest. Would I be willing to paint in the Xerox booth? Soon after Tamara StClaire, Chief Innovation Officer at Xerox Healthcare, reached out to me about joining The Walking Gallery. She is passionate in her belief that we are on the cusp of great change in medicine. At the intersection of Genomics, HIT and mobile devices a swirl of creation is advancing. Tamara is determined that technology advance in a way that is patient centric. On Wednesday the 2nd, I created another HIMSS painting entitled, “Value Based Care vs. Fee For Service.” This painting was based in great part on the results of a survey Xerox Health recentlycommissioned. 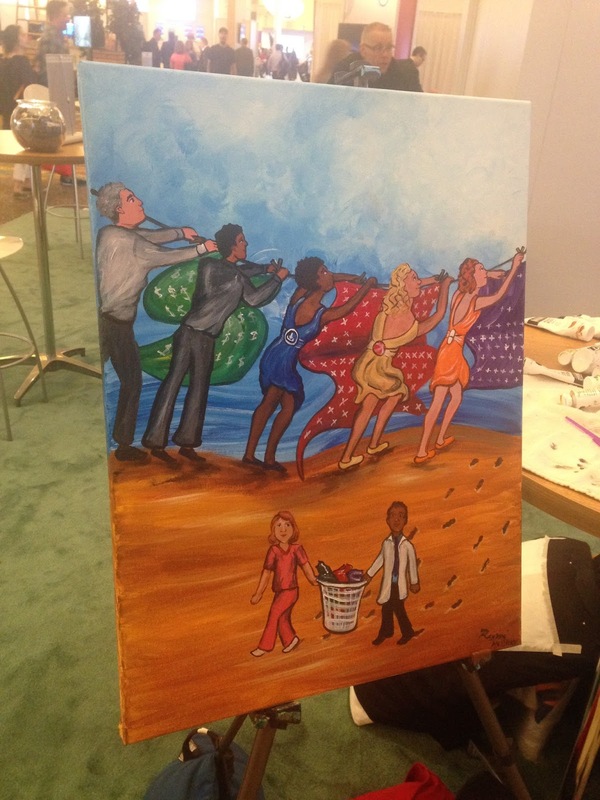 This painting was representing the adoption rate for doctors and practices for the new value based care payment model. Later that evening, I would finish my last painting. This canvas would be painted whilst I took part in a round table discussion about the landscape of care in the US. In the prior two paintings, I plenty of time to paint and hours of overheard discussions to build on. The evening painting had to be completed within three hours. I opened my mind’s eye and looked for a vision. I saw a flying saucer with the Xerox emblem. So although that was a very odd thing to paint, I began my brushwork, connecting the ship above to the buildings below. Then I titled the painting, “Investigating the Idea.” I finished the painting and handed it to the great folks sitting at the tables. An employee asked me, “How did you know we call Xerox the mother ship?” I looked at her and quietly laughed. I didn’t know, but I guess my brush did. Then I gathered up my supplies and left Las Vegas. I left happy and a bit tired. Much had been accomplished in two days. The Xerox Healthcare team was incredibly kind and I am very glad they invited me to the table. to understand the origin of the idea. 1. Promise that you will wear this jacket to conferences and public events at least 2-3 times per year in order to spread awareness of the power of the patient voice. Signifying you understand that a Walking Gallery jacket is to be worn. It should not to be placed upon the wall as a static canvas nor sold to another. This gift is freely given between artist and walker. The Walking Gallery is a movement open to all and you will proudly walk this path to help others. 2. Send a business jacket. Please do not send jackets made of seersucker, corduroy, knit, denim, leather or stretch fabric, as they are hard to paint on. Absolutely do not send stretch fabric. We cannot paint on stretch fabric, as the painting will shred. You can check to see if a jacket is stretch by trying to pull at the fiber on the horizontal. Fabrics that usually work well are poly-blends, linen, cotton and wool. Also you might want to buy a jacket a size larger than you usually wear as the painting will stiffen the back and make it harder to close the buttons. Black is the preferred color as it does not show wear, but any color is welcome. Also this is a business jacket on purpose, we are painting on the “uniform” of the conference attendee. We have painted on a handful of lab coats, usually for staff that are willing to wear them to work. 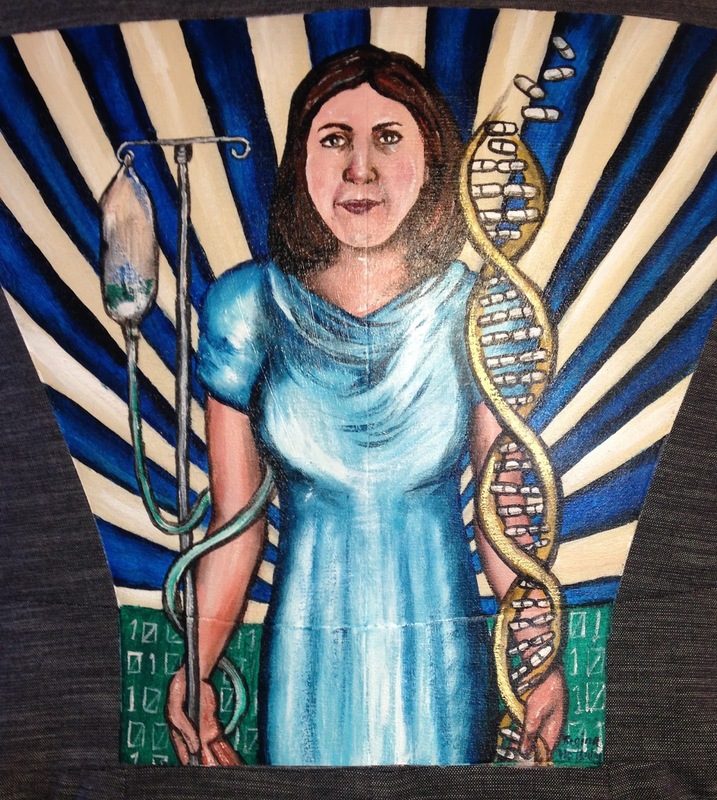 If we paint on your lab coat, you must be willing to wear it to a conference or public event. Please ship the jacket to 189 Main Street, Grantsville, MD 21536 if you would like it painted by Regina Holliday. Please private message Melody Smith Jones on Facebook if you would like her to paint your jacket. 3. Tell me your life/patient story, your patient-centered concept that is the center of why you work in health and medicine. Please include personal details of your life so I can more fully realize your image. You can tell me which story elements you do not wish to publicly disclose in text, but it does help to know the underlying experiences and conditions that are the source of your mission. Please send via email with some pictures if possible of yourself or the people in your story to reggieart123@yahoo.com. If you don't want to provide a picture, that’s okay, I have a vivid imagination. Also please print it out and send with jacket so I can keep track of jackets and their stories. 4. Artists can participate by painting their own jacket or another's or both. 6. You are free to use the image in your own advocacy mission; I also retain the right to reproduce the image for advocacy purposes and write about your mission in areas you are comfortable with disclosing. 8. Any venue can host a gathering, but they must be willing to invite Walking Gallery members that are not part of the conference or official event. There is only one gallery, no regional ones. We are all members of the same movement. You are joining a movement and this is a sacred oath to walk the walk and spread the word.